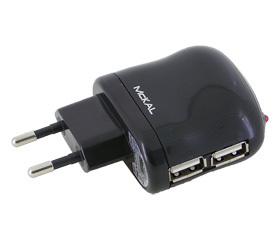 McKAL power is a travel adapter with 2 USB ports and is designed to deliver up to 1.5A for charging iPhones and SmartPhones (Android, Blackberry, Symbian, W7 and others). With 2 USB ports, you can now charge 2 SmartPhone devices simultaneously with a total power of 1.5A. power is worldwide-ready with universal input of 100V to 240V - you can use it virtually at any powerpoints around the world. With a maximum output of up to 5V 1.5A, McKAL power matches the performance of the SmartPhone original chargers to ensure full and fast charging. The small and compact form lets you slip it easily into your laptop bag or backpack when on the move. Pair it with McKAL smart retractable cable for SmartPhones for the ultimate experience in mobility charging. ie. 1 power travel adapter and 2 charging cables to charge two SmartPhones even of different brand and model (with the right MM63x, MM83x) simultaneously. Ideal for home and traveling to reduce items to carry and to save power.